If you need to get in touch with a teacher, please visit their individual classroom webpages here. St. Francis Xavier Elementary School uses SchoolReach. Parents and teachers will be notified by phone with a recorded message regarding the announcements. School email alerts and TV alerts on Channel 7 will also be utilized. Any cancellation announcements will be posted on the home page of the school website. Thank you for inquiring about St. Francis Xavier Catholic School! Please note that it may take up to 24 hours during business days to receive a response. If you need immediate assistance, please call the school. Thank you and God Bless! 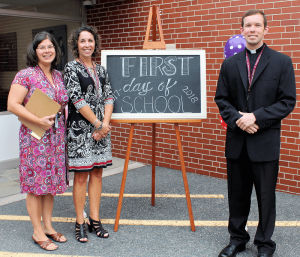 Pictured, from left: Assistant Principal of St. Francis Xavier School in Acushnet, Mrs. Anabela Shaughnessy: Principal, Mrs. Michelle Russo; and Administrator of St. Francis Xavier Parish in Acushnet, Fr. Riley Williams. For further information, please call the school office at 508-995-4313 or you can submit an inquiry via the form on this page.